The Infinite X Plus Desktop Computer from MSI is a powerful gaming system built with the aesthetics to match. Moreover, it uses genuine MSI components such as the Z390M Mortar motherboard. Users can also upgrade or swap out components if needed. 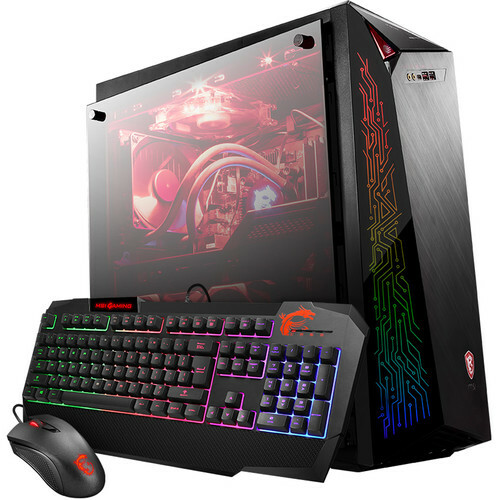 Specs-wise, it's equipped with a 3.6 GHz Intel Core i7-9700K eight-core processor, 16GB of 2666 MHz DDR4 RAM, a 512GB PCIe NVMe SSD paired with a 2TB 7200 rpm HDD, and an MSI GeForce RTX 2080 VENTUS 8GB graphics card. Other integrated features include Gigabit Ethernet, 802.1ac Wi-Fi, USB Type-A and Type-C ports, HDMI and DisplayPort outputs, and multiple audio jacks. The operating system installed is Windows 10 Pro. This MSI desktop is equipped with a custom all-in-one liquid CPU cooler, which can offer lower temperatures and has a customizable LED-lit dragon logo on it. Moreover, the case is split into three chambers, separating the CPU, GPU, and PSU for more efficient cooling. The Infinite X Plus has a built-in handle, so you can easily take your system where you need to. Additionally, the graphics card is installed vertically to prevent it from bending or damaging the PCIe slot during transportation. Customize your system's lighting with MSI Mystic Light. Choose from a variety of lighting effects and over a million colors to best suit your aesthetics. Audio Boost includes a mix of hardware and software enhancements designed to provide you with crisp, clear audio, which is helpful for headphone users. Dragon Center is a suite of gaming and system monitoring software including options like Gaming Mode, Game Boost, USB Speed Up, OC Setting, Total Fan Control, Live Update, and more. Nahimic 3 provides you with virtual 7.1-channel surround sound for an immersive listening experience. Adjust your audio input and output settings using the downloadable software. Box Dimensions (LxWxH) 24.1 x 22.5 x 13.5"